Are you looking for an easy recipe to WOW your friends, family, co-workers? OK. Here it is. As long as you have a crock pot, I guarantee you will be a hero. These are absolutely delicious and addictive, so plan on having plenty of people you can pawn them off on, unless you're looking to gain a few (or more) pounds this month! Throw 4 ingredients into a large crock pot, set on "LOW" for an hour and a half, stir, pour onto wax paper and VOILA!!!! Instant happiness! If you really want to be fancy, you can use tempered chocolate! 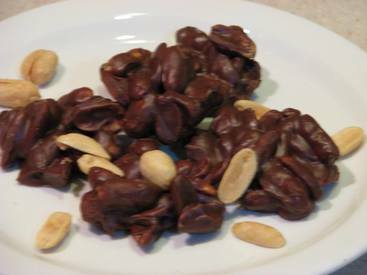 Happy National Chocolate Covered Peanuts Day!